The Institute without Boundaries (IwB) has a nine-month intensive postgraduate certificate program called Interdisciplinary Design Strategy (IDS) offered through the School of Design, at George Brown College in Toronto. The program teaches design strategy, research, and collaboration to students from diverse professional and academic backgrounds. In the IDS program, students and faculty collaborate with a partner organization to understand and tackle real-world challenges. Guided by the demands of a major project partner, students learn skills, conduct research, create comprehensive proposals and present their work to stakeholders and the public. The IDS program runs in tandem with the IwB’s research, special projects, and consulting work thereby giving students and partnering organizations the opportunity to learn from one another. Students experience the demands of a real project and develop the intellectual and creative rigour required to tackle it. The IDS program changes theme from year to year, paralleling the arc of the Institute’s major research concerns. Our curriculum is composed of core courses, modules, research trips, and hands-on work with our partners. The curriculum is tailored to the students’ learning needs, the major project research objectives, and the partner organization’s goals. The Institute has pioneered a graduate-level curriculum using a design-based education model that fosters learning across disciplines, integrating specialized knowledge, and breaking down geographic, cultural, and social barriers. Throughout the semester, students engage in a process of research, analysis, conceptualization, proposition, visualization, experimentation, testing, revision, and presentation of their ideas and projects. The Institute also hosts lectures, seminars, workshops, and intensive learning sessions from industry leaders. This process combines apprenticeship with classroom and studio-based education, forming a unique pedagogical approach. The IDS program is very demanding and provides a myriad of critical thinking and hard skills. Graduates of the IDS program receive a postgraduate certificate in Interdisciplinary Design Strategy. The IwB’s design education prepares students for a variety of jobs at a strategic level across industries, in the private, public, and not for profit sectors. Our graduates can also be found in top design offices internationally. We have an exciting year ahead. Stay tuned for our project work! For more information, see our course outline and sample curriculum book or contact us. ANNOUNCING Masters of Arts in Interdisciplinary Design Strategies! 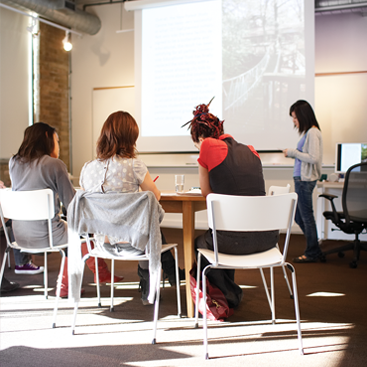 IwB alumni and students who have successfully completed the Interdisciplinary Design Strategy Post-Graduate Certificate through the School of Design at George Brown College, may now apply for advanced entry into this unique master’s program at IADT. The IwB curriculum is delivered in a studio environment where students work on real projects. The nine-month school year is broken into two semesters: Fall (September-December) and Spring (January-June). The program is a combination of short and long-term projects as well as several courses that connect and overlap throughout the year. Below is a list of our courses. For course descriptions see the sample curriculum book below. The IwB is an interdisciplinary and hands-on learning environment where the design process is of equal importance to the final design results. It is expected that students will collaborate with faculty, mentors and advisors to continuously evolve and improve their design ideas and products through a process of research, analysis, ideation, visualization, testing, reiteration, and self-evaluation. For a detailed account of IwB student learning outcomes, benefits, and evaluation procedures see the sample curriculum book below. Contribute to a multi-disciplinary studio environment where faculty, mentors and advisors collaborate to conceptualize, visualize, design and learn from each other. Work on real-world challenges that have the potential for global benefits. Share findings with the public and IwB partners in a meaningful way. Learn through participation in every aspect of a project, assuming a variety of roles. Attend lectures, seminars and workshops from industry leaders that augment overall knowledge and skills. Receive critical feedback, appraisal, direction and support from faculty, peers and mentors on project deliverables to augment the self-evaluation process. Practice a “think and do” research approach, applying primary and secondary applied research methodologies to the design process. Follow best practices of a professional design studio using design strategy, design briefs, design management and project management tools. The IwB frequently partners with other educational institutions around the world to run summer school programs and charrettes. Past summer schools have included the Belgian Summer School, in partnership with REcentre, and the Startup Startup City, organized in partnership with the Dublin City Council. And most recently the 2016 Future Ways of Living Summer School. IwB summer programming is a great opportunity for both students and design professionals to engage in short term hands-on projects using IwB methods. Contact us if you’re interested in being a charrette participant or if you would like to hire us to run a charrette for you during the summer months. To apply to the IwB, please click here. In addition to the academic division, the IwB also has a special projects division. To find out more about the IwB please visit our FAQ or contact us.